It is estimated that in 2011 in Slovenia more than 136 million EUR of subsidies were allocated in the energy sector (91.9 mio EUR in constant prices with reference year 2000). 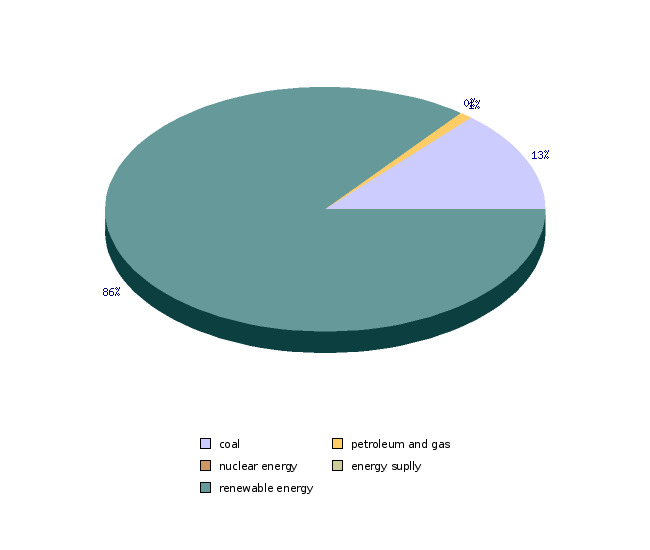 Share of subsidies for use of fossil fuels represented only 13.5 % in 2011, while in 2001 their share was 61 %. Subsidies for energy efficiency measures and renewable energy sources have greatly increased in the observed period representing 85.6 % of total subsidies in 2011. Subsidies in the energy sector can harm or benefit the environment. Environmentally harmful are those subsidies that lower the price of environmentally harmful energy by changing the relative relations between energy prices to the benefit of the resource that is subsidized; this causes an over-demand of energy that is harmful to the environment. Environmentally friendly are those subsidies that are intended for the use of sustainable energy sources, since the latter are less harmful to the environment – such as conventional energy sources. Subsidies can have an influence on a decrease of the price of such energy and can improve its competitiveness with regard to environmentally harmful energy. At the level of EU countries, there is no common agreement regarding the definition of subsidies in the energy sector. The term subsidy most frequently includes direct payments to an energy producer or consumer; however, subsidies can also include other, less transparent forms of aid or supporting mechanisms, such as exemption from the payment of taxes and discounts, control of prices, restrictions in trade, restrictions in entering the market, etc. One of the forms of subsidizing is also that the state, with its tax policy, inefficiently eliminates market irregularities, since energy taxes insufficiently include external costs of energy production. Notwithstanding the mechanism of subsidies, we are dealing with two forms of subsidies - »on-budget« subsidies and »off-budget« subsidies. The first ones represent a direct burden to the budget, while the latter ones are paid out through other sources and methods. The data sheet indicates the data on subsidies in the energy sector; the data were obtained from the records of the Ministry of Finance. 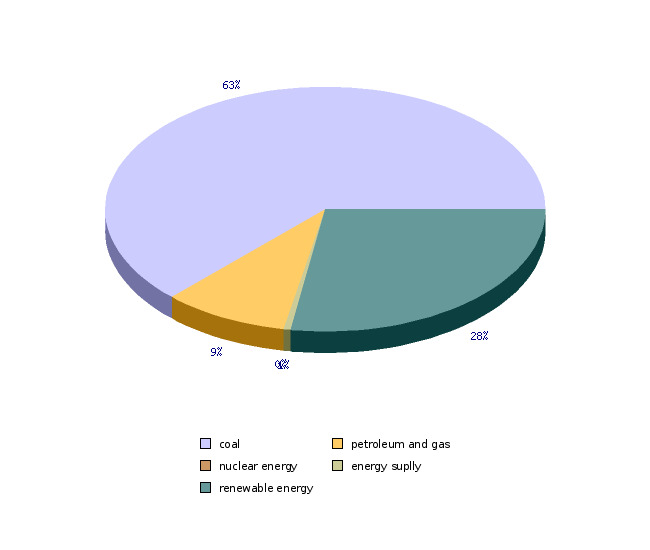 The data include forms of aid that were allocated to companies, the basic activity of which is coal mining, electricity and heat production, natural gas distribution; such forms of aid include all categories of state aid (aid to research and development, aid for small and medium enterprises, aid for restructuring, employment, training, energy savings and environmental protection, regional aid). The data sheets also indicate the data on non-refundable funds that were allocated by the Ministry of the Environment and Spatial Planning to legal and natural persons for implemented measures of efficient use and renewable energy sources and for promotional and educational activities as well as funds (in the amount of a subsidized interest rate) that were allocated by the Eco fund for investments in the area of air and climate protection. Data sheets also include allocated funds in the area of priority dispatching of electricity. These data are not included in the records of state aid, since priority dispatching was not considered as state aid until 2007; in accordance with a decision of the European Commission on the scheme of state aid, priority dispatching of electricity must also be considered as one of the forms of state aid. Ministry of Finance, 2012; Ministry of the Infrastructure and Spatial Planning, 2012; ELES, 2012; Ecofund, 2012. Slovenian energy policy that is defined in the Resolution on the National Energy Programme set specific objectives in the area of subsidizing, especially in the area of efficient use and renewable energy sources. National Action Plan for Energy efficiency adopted in 2008 and National Action Plan for Renewable sources adopted in 2010 defined new energy related targets and needs for financing. Programmes did not set targets for financing but include estimates of the costs of their implementation. In the area of subsidizing the use of coal, Decision 1407/2002/EC was adopted at the EU level, which permits the continuation of coal subsidizing until the end of 2010; the subsidies are supposed to be intended for restructuring of production with regard to social and regional aspects and provision of access to economically justified supplies of domestic coal as strategic reserves. Source database: The data on subsidies and state aid are collected by the Ministry of Finance since 1998. The data on state aid can be found in the records on state aid, while the complete data on funds intended for the promotion of efficient use and renewable energy sources are kept by the Ministry of the Environment and Spatial Planning and by the Eco Fund. The data on priority dispatching is administered by the system operator of electricity - ELES. Data administrator: the Ministry of Finance, Ministry of the Environment and Spatial Planning, ELES and Eurostat. Methodology and frequency of data collection: The data on state aid and subsidies are collected promptly by individual authorities for each individual year. The methodology of data collection is determined only by the Ministry of Finance, which also keeps records of state aid; namely, the Ministry of Finance must classify in its records only the state aid. 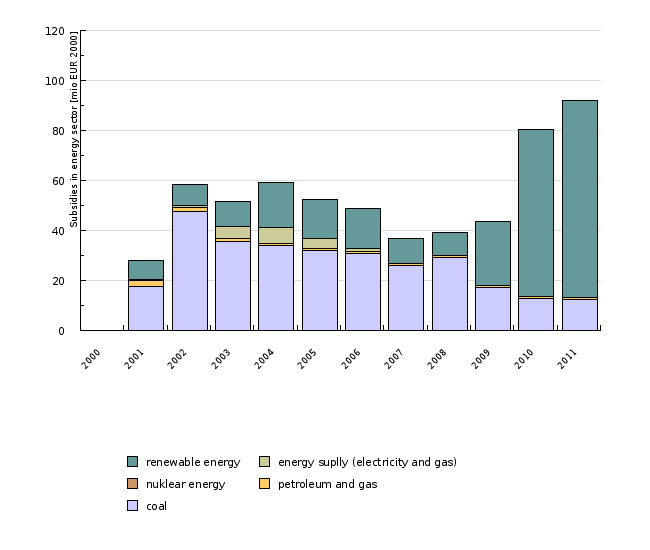 A substantial share of payments in the energy sector is not in the form of state aid (for instance, non-refundable funds and a subsidized interest rate for efficient use and renewable energy sources for households and small and medium enterprises); therefore, these funds are not recorded in these records. Furthermore, funds received from priority dispatching were also not considered, until 2007, as state aid and were not included in the records. In accordance with a decision of the European Commission (Case No C 7/2005), the Ministry of Finance shall have to include priority dispatching in the Records on state aid. The data on priority dispatching were obtained from ELES, while from 2007 these data are also available from the Records on state aid. Data processing methodology: The data on subsidies were obtained in current prices. The nominal data had to be deflated with the GDP deflator to obtain a time comparison and for the determination of real changes in the amount of subsidizing funds. - Advantages: the source of basic data on subsidies for the period 2000–2006 is the Ministry of Finance; however, the data in its records do not represent all funds (subsidies) that were paid in the energy sector. Other sources of data are the Ministry of the Environment and Spatial Planning, the Ecological Development Fund and ELES. - Reliability: The data were obtained from four different sources (administrators); therefore, there is a possibility that some amounts of paid-out subsidies are doubled. - Resolucija o Nacionalnem energetskem programu (ReNEP) (Resolution on the National Energy Programme, Official Gazette of the RS, No. 57/2004) DZ.